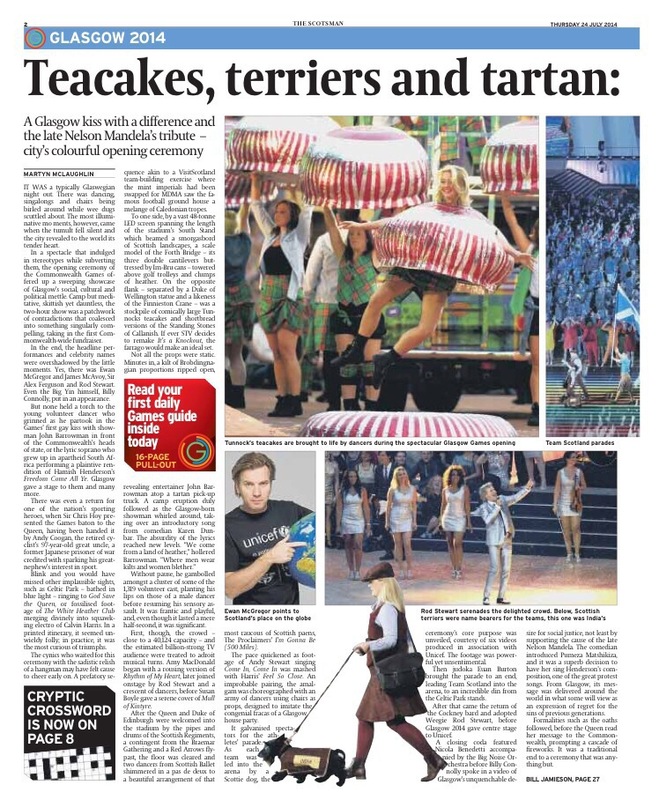 ‘Teacakes, terriers and tartan: Glasgow welcomes the world’ from The Scotsman. The opening ceremony of the Glasgow 2014 Commonwealth Games. IT was a typically Glaswegian night out. There was dancing, singalongs and chairs being birled around while a drove of wee dugs scuttled around oblivious to the bedlam. The most illuminative moments, however, came when tumult fell silent and the city revealed to the world its tender heart. In a sprightly and effectual spectacle that indulged in stereotypes while subverting them, the opening ceremony of the Commonwealth Games last night offered up a sweeping showcase of Glasgow’s social, cultural and political mettle. Camp but meditative, skittish yet dauntless, the two hour show was a patchwork of contradictions that coalesced into something singularly compelling, taking in the first ever Commonwealth-wide fundraiser. In the end, the headline performances and celebrity names were overshadowed by the little moments. Yes, there was Ewan MacGregor and James McAvoy, Sir Alex Ferguson and Rod Stewart. Even the Big Yin himself put in an appearance. But none held a torch to the young volunteer dancer who grinned as he partook in the Games’ first gay kiss in front of the Commonwealth’s heads of state, or the lyric soprano who grew up in apartheid South Africa performing a plaintive rendition of Hamish Henderson’s Freedom Come All Ye. Glasgow gave a stage to them and many more. There was even a return for one of the nation’s sporting heroes, when Sir Chris Hoy presented the Games baton to the Queen, having been handed it by Andy Coogan, the retired cyclist’s 97-year-old great uncle, a former Japanese prisoner of war credited with sparking his great-nephew’s interest in sport. Blink and you would have missed other implausible chapters of history being written, such as Celtic Park – bathed in blue light – ringing to the verses of God Save the Queen, or fossilised footage of The White Heather Club merging divinely into squawking electro of Calvin Harris. In a printed itinerary, it seemed unwieldy folly; in practice, it was the most curious of triumphs. 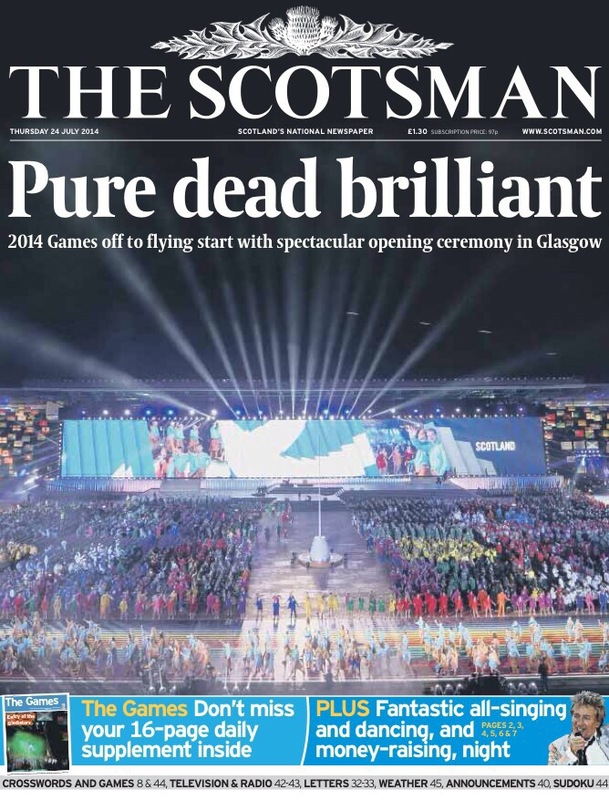 The cynics who have waited for this ceremony with the sadistic relish of a hangman over the 2,447 days since Glasgow won its bid may have felt cause to cheer early on. A prefatory sequence akin to a VisitScotland team building exercise where the mint imperials had been swapped for MDMA saw the famous football ground house a melange of Caledonian tropes. To one side, by a vast 48 tonne LED screen spanning the length of the stadium’s South Stand which beamed a smorgasbord of Scottish landscapes, a scale model of the Forth Rail Bridge – its three double cantilevers buttressed by Irn Bru cans – towered above golf trolleys and clumps of heather. On the opposite flank – separated by a Duke of Wellington statue and a likeness of the Finnieston Crane – was a stockpile of comically large Tunnocks teacakes and shortbread versions of the Standing Stones of Callanish. If ever STV decide to remake It’s a Knockout, the farrago would make an ideal set. Without pause, he gambolled amongst a cluster of some of the 1,319 volunteer cast performers, planting his lips on those of a male dancer before resuming his sensory assault. It was frantic and playful, and even though it lasted a mere half second, the kiss hinted that profound beneath the couthie cavalcade. First, though, the crowd – close to a capacity of 40,124 – and the estimated billion-strong television audience were treated to adroit musical turns. Amy /MacDonald began with a rousing version of Rhythm of My Heart, later joined onstage by Rod Stewart and a crescent of dancers, before Susan Boyle gave a serene cover of Mull of Kintyre. After the Queen and the Duke of Edinburgh were welcomed into the stadium by the pipes and drums of the Scottish Regiments, a contingent from the Braemar Gathering and a Red Arrows flypast, the national anthem sung by the Braemar Ensemble punctuated a gradual metamorphosis towards a mood that would soon turn contemplative. With the floor cleared, two dancers from Scottish Ballet shimmered in a pas de deux to a beautiful arrangement of that most raucous of Scottish paens, The Proclaimers’ I’m Gonna Be (500 Miles). The pace quickened as footage of Andy Stewart singing Come In, Come In was mashed with Harris’ Feel So Close. An improbable pairing, the amalgam was choreographed with an army of dancers using chairs as props, designed to imitate the congenial fracas of a Glasgow house party. It galvanised the spectators for the athletes’ parade, ordinarily a lull in proceedings. Instead, an imaginative reconfiguration kept momentum building, with each nation’s competitors grouped into regions, allowing for a series of musical motifs. As each team was led into the arena by a Scottie dog, the ceremony’s core purpose was unveiled, courtesy of six videos produced in association with UNICEF. The footage was powerful yet unsentimental, with ordinary Scots telling of the children’s charities everyday work. With that came the return of the Cockney bard and adopted Weegie, Rod Stewart, with Can’t Stop Me Now, a song from his latest album. 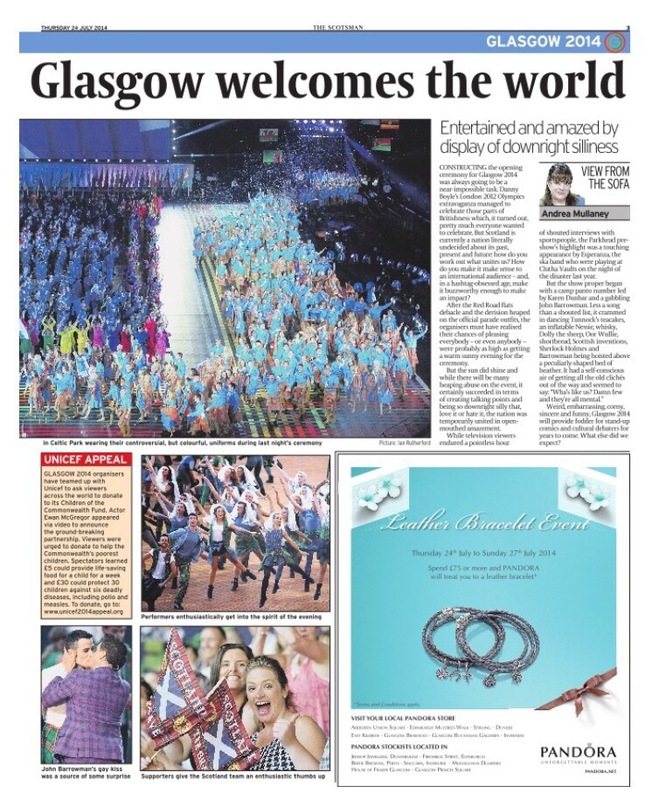 At its climax, Glasgow 2014 gave centre stage to UNICEF. Sir Chris and McAvoy urged spectators to donate just £5 towards its Children of the Commonwealth Fund via text. The crowd held aloft a sea of phones, imploring those at home to follow suit. It was among the most powerful junctures of the night, a quintessentially Glaswegian moment of dogged compassion. A closing coda featured Nicola Benedetti accompanied by the Big Noise Orchestra before Glasgow nearly exploded as Billy Connolly spoke in a video of Glasgow’s unquenchable desire for social justice, not least by supporting the cause of the late Nelson Mandela. The comedian then introduced Pumeza Matshikiza, a young woman old enough to remember South Africa at its worst. It was a superb decision to have her sing Henderson’s composition, one of the great protest songs. From Glasgow, its message was delivered around the world in what some will view as an expression of regret for the sins of previous generations. Formalities such as oaths followed with First Minister Alex Salmond among those to make a speech. The Queen, having received the baton, then read her message to the Commonwealth, prompting a cascade of fireworks. It was a traditional end to a ceremony that was anything but. A capricious show greater than the tally its lowest common cultural denominators might have suggested, it melded gaiety with purpose, demonstrating a city that can be synchronously daring and delicate. You don’t need to demolish tower blocks to feel the earth move.